Unlike basic factoring when the supplier (the seller) starts the process, Reverse Factoring is initiated by the ordering party (the buyer). The buyer is usually a larger company looking to extend payment terms without affecting their suppliers cash flow. Reverse factoring is similar to basic factoring as it involves three parties: the seller, the buyer and the factor. The buyer initiates the process and chooses which suppliers he will allow to be paid earlier by the factor. 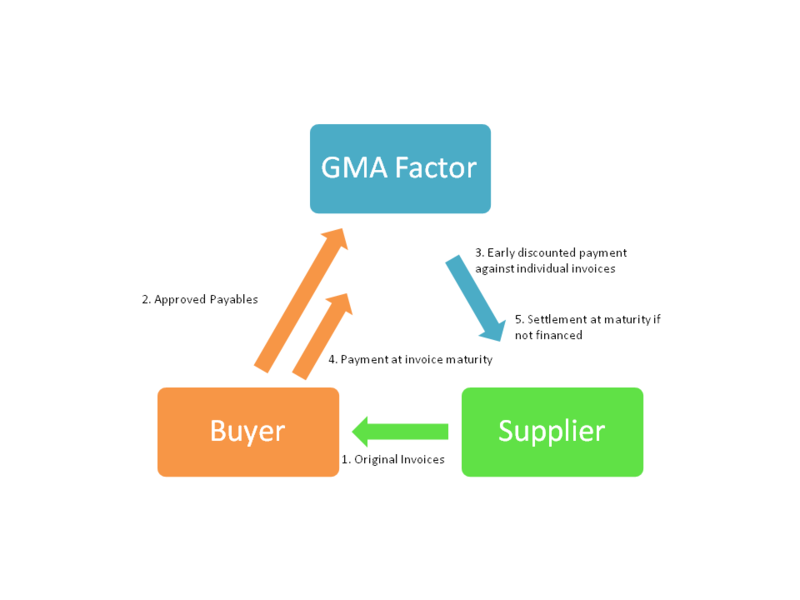 The supplier will then choose which of the invoices he wants to fund through GMA Factor. Both the buyer and the seller benefit from reverse factoring by increasing their cash flow. The seller can get their invoices paid in as little as 10 days versus the 45 to 60 payment terms. The buyer can delay actual payment of the invoice by up to 120 days. Please contact us for more information, or fill out the short application to the right and a finance specialist will contact you immediately.